Antonov Airlines has started negotiations with the Luxembourg-based NATO Support and Procurement Agency (NSPA) on the carrier’s further role within the Strategic Airlift International Solution (SALIS) project. NSPA is the official coordinator of the uplift capacity offered by AN-124 operators via Germany-based companies in Leipzig. The step follows Volga-Dnepr’s announcement to terminate their commitment at the end of this year. Time is pressing because SALIS might run into transport problems if the capacity provided by Volga-Dnepr is not compensated after their stepping out of the deal by the end of next December. So far, the SALIS contract provides two AN-124-100 aircraft on part-time charter, two more on six days’ notice and another two on nine days’ notice. This capacity was until recently split between Antonov and Volga-Dnepr. But since 2017 both companies are pursuing their own paths by dividing the transports requested by NATO/EU between the SALIS successors Antonov SALIS and Ruslan SALIS accordingly, with each of the two companies working strictly on its own account. Which for sure doesn’t make things easier for coordinator NSPA. However, thanks to Antonov’s approach, Volga-Dnepr’s decision to stop flying for NATO/EU might not have any major impact on the transportation capabilities of the western alliance, since Antonov could become the white knight for the pact. 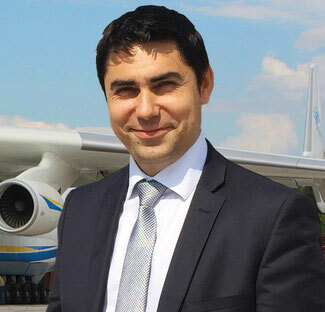 Asked about his airline’s offer to NATO/EU, Mr. Blagovisniy confirmed to CargoForwarder Global that Antonov is ready to station two AN-124-100s permanently at Leipzig-Halle airport. This way compensating the loss of capacity caused by Volga-Dnepr as of January 2019, when the Russian carrier terminates its SALIS commitment, withdrawing one of its AN-124s from duty that was permanently based in LEJ up to now. Should transport demand go up, however, “we could expeditiously increase the number of our AN-124s to four and even provide six AN-124s, but only if we are provided some lead time,” Mr Blagovisniy announces. He adds to this that such a case hasn’t happened since SALIS was incepted in 2006. 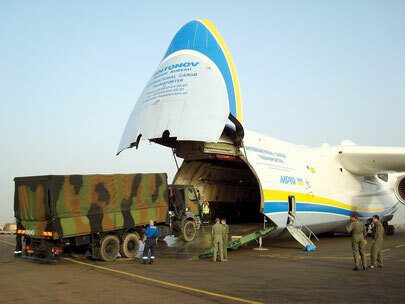 Apart from one request back in 2013, when all 6 AN-124s were demanded by NATO/EU, three provided by Antonov Airlines and Volga-Dnepr respectively, for urgently flying equipment to intervention troops in Mali to prevent Islamic militants to take over power. That time both companies provided even more AN-124 aircraft. But this was a one-off event. In addition to their seven unit fleet of AN-124-100s Antonov Airlines is offering SALIS their giant AN-225 “Mriya” for use. The big freighter aircraft is able to carry up to 250 tons per flight, but only over a rather short distance of 2,500 km without refueling. Their bid to NSPA further includes an AN-22 freighter, the biggest turboprop aircraft in operation worldwide, able to accommodate 60 tons on its main deck, capable of landing on unpaved and remote airstrips. Mr Blagovisniy stresses that his company’s capacity provision approach is based on two main pillars, an economic and a political reason. Commercially, because the Antonov - NATO/EU collaboration is good business for his company, filling the cashes of the state-owned provider. The manager admits that his airline’s charges for SALIS transports exceed those of competitor Volga-Dnepr. “As designer of the AN-124 and holder of the aircraft type certificate, our company continuously modernizes the AN-124 fleet in order to meet all international requirements. Simultaneously, we replace Russian components in the aircraft by Ukrainian-manufactured and Western equipment." All these processes require engineering work and maintenance efforts, a lot of testing and operational certification. This all leads to a reduced market availability of the aircraft for commercial purposes. Volga-Dnepr as pure operator of AN-124s “does not have to shoulder alike efforts," he argues. Turning to the second issue, the political background, Mr. Blagovisniy emphasizes that Antonov Airlines’ intended business arrangement with the NSPA is also favorable for the Ukraine, helping the country to deepen its ties with the west. This might also support plans to cooperate in designing and constructing new aircraft programs, he adds. “Fact is, we want to demonstrate our partnership with the West, by supporting the NATO/EU, accomplishing their transport demands.” It’s a matter of responsibility and a sign of appreciation, he resumes.